Who Was Mary Digges Lee (1745-1805)? 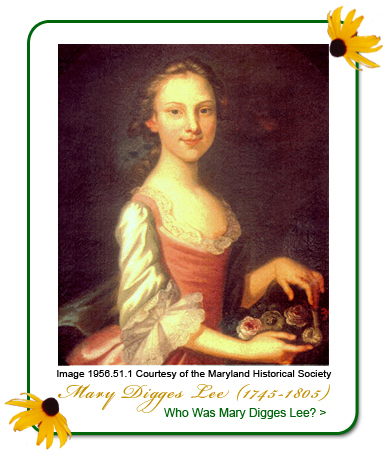 Mary Digges Lee was born in Maryland to a prominent family. Her father Ignatius Digges (1707-1785) was a wealthy landowner and politician who occasionally entertained George Washington at his home, Melwood Place, located in Upper Marlboro, Maryland. Mary Digges married Thomas Sim Lee on November 27, 1771. He was the son of Thomas and Christianna Sim Lee, who were part of the Blenheim branch of the Lee family of Virginia. Accordingly, both Thomas Sim Lee and his bride, Mary Digges, were in a position to achieve great success. Thomas Sim Lee was twice the governor of Maryland, serving during the years 1779-1783 and 1792-1794. 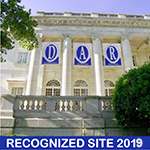 His tenures as governor occurred during politically pivotal years in the history of Maryland as a state in the new government of the United States of America. Thomas Sim Lee signed the 1781 act that ratified the Articles of Confederation and Perpetual Union, the first constitution of the newly formed United States. The signing of this act was a statement of freedom that stands as the culmination of Thomas Sim Lee's work to guide Maryland into its place as a part of the newly formed union of United States. He had been a member of the Annapolis Convention of 1774-1776 and signed the Declaration of Association of the Freemen of Maryland. This important document represented the combined efforts of many influential men in Maryland and defined the intent of the people of Maryland to free themselves from British rule. Mary Digges Lee was not only privy to the maneuvering and governmental processes during the formation of the new United States of America, but she also played an active role in supporting the troops while they were engaged in war. George Washington had appealed to Governor Lee to help support the struggling troops due to his fear that the Maryland militia might have to disband for lack of provisions. This request propelled the energetic Mary Digges Lee into action. She decided to raise money and supplies for the troops. She rallied the women of Maryland to raise money and to sew shirts and other pieces of clothing that were sent to help the troops. The Council of Maryland wrote Mary Digges Lee on August 25, 1780, expressing gratitude to her for delivery of 260 shirts from Maryland women. Later, on September 27, 1780, Mary Digges Lee wrote George Washington to inquire as to the best way those funds could be utilized in support of the patriotic cause. In his response on October 11, 1780, George Washington thanked Mary Digges Lee for her efforts and suggested that the funds be used for the purchase of shirts and stocks (black). Unfortunately, any written organizational efforts for this project in Maryland have not survived, but the amount of money and supply of clothing must have been significant for George Washington to take the time to thank Mrs. Lee for her work to supply the troops with necessary provisions. During the term of Maryland Governor Parris Glendening (1995-2003), First Lady of Maryland Francis Glendening initiated an effort to chronicle the lives of the various first ladies of Maryland. The accomplishments of many of the first ladies had been lost in the popular historical records of the State of Maryland. In 2000, with the help of Mrs. Glendening, a collection of paintings of first ladies of Maryland went on display near the State House in Annapolis. Included was a portrait of a young Mary Digges before her marriage to Thomas Sim Lee. This portrait is permanently located at the Maryland Historical Society in Baltimore.